When I was a kid, I absolutely loved sports like gymnastics, basketball, hockey, skiing, ice skating, and swimming. 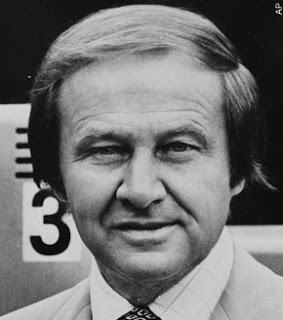 Almost all of this - I attribute to ABC's Wide World of Sports program and its main commentator - Jim McKay. Side note: As you probably heard, he passed yesterday at the age of 86. I have seen him in a handful of interviews over the years and he seems to be a man who was grateful for all that he was allowed to experience during his long life. The first time that I ever came across him was during the 1972 Munich Olympics. He wasn't the main host of the televised events (I think that Chris Schenkel was). He was however, brought on during the hostage crisis. I was almost 6 years old when this happened. I have so many memories of this time (1972 Munich Olympics) but will leave that for another blog entry as it covers a whole range of "firsts" for me. There's nothing like the 70's opening of WWoS. WWoS would come on after cartoons on Saturday and then again on Sundays. The opening still gives me goosebumps and watching the guy wipeout on his skis and the chick balance her neck and head on the balance beam - well - hey - it made me uncomfortable to watch - but I watched it each and every time! I think that the drama-filled music attracted me to marching band in my later years. Who could not love this music??!!! Are you sure we're not twins separated at birth? No, I guess not, since you're three years younger than me. But gosh, every time you post, it's like you were spying on my childhood. Captain Kangaroo, Saturday morning cartoons and Wide World of Sports. What's next -- ABC After School Specials? Ah yes my friend - I have a list of about 200 things (I kid you not) to write about on this blog and those awesomely titled ABC Afterschool Specials are on here.